No, I think PPP is overated. Anybody but the most devoted DailyKOS Koolaid drinker can see what you guys are up to: Elevate Dems & Obama, and hammer notable Repubs as possible now that the midterm is over, and you don't have to worry about being called to account since the next election is 2 years away. Most of the time it is former Gov Palin whoi is the subject of one of your rigged polls; Today it is Sen elect Rubio. I didn't notice what you guys were up to until you published a poll right after the midterm that showed Obama at 51% approval in VA, and a week later an independent poll showed he was 35% approval in VA. That's when I realized you guys were rigging your polls to push a "meme". The midterms are over and the next election is 2 years away, more than enough time for you to "tweak" your samples to be more realistic when the time comes. You realize you are just about the only people polling right now, so you know your polls will get a lot of publicity - Without the MSM pointing out that you are Dem & DailyKOS affiliated polling outfirm. You may fool people for a while, but astute followers know what you guys are up to. After all, you are paid by DailyKOS so it is in your interest to "tweak" your samples so they get the desired result and keep coming back for more. Eventually, this will catch up to you; Obama & the Dems are NOT popular these days. Obama's numbers would have probably been similar at the same stage in his senatorial career. A poll at this stage carries little, if any, relevance. When are you polling South Carolina again? Would be interesting to see if your last poll was just an outlier or if Huckabee really is 4th in that state (he came in 4th last time you polled the state in May as you may recall). Huckabee's viability depends on his ability to win SC. He needs to win SC, become second or third in New Hampshire and then on to a victory in South Carolina I think. On the other hand, if Palin is strong in SC, that may be a sign (admittedly early) that her campaign may be able to recover from a loss in Iowa. Hope you poll SC soon. Happy new year. 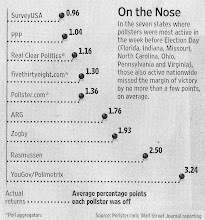 PPP is one of the most accurate polls, and your favorite polls are the rigged Biasmussen polls. We don't currently have any plans to poll SC, as you can see by the options in our readership poll, but I'm sure it'll be polled sometime in the early months of 2011 as the presidential race starts to heat up. We haven't done IA since I think June either. New Iowa aand South Carolina polling in early '11 would be very, very, very nice to see. Don't think IA/NH polling is very useful until the campaigning starts in earnest. Perhaps better than simple horserace is "how likely are you to support" (insert candidate name) to figure out the possible floor/roofs on their support. PPP is irrelevant & out of touch with the American people... or at least the ones that are trying to survive this economic disaster. Ronald Reagan was accurate: the government is the problem, and that includes right now! The tea party is making a difference & at least Pelosi is out on her ear!